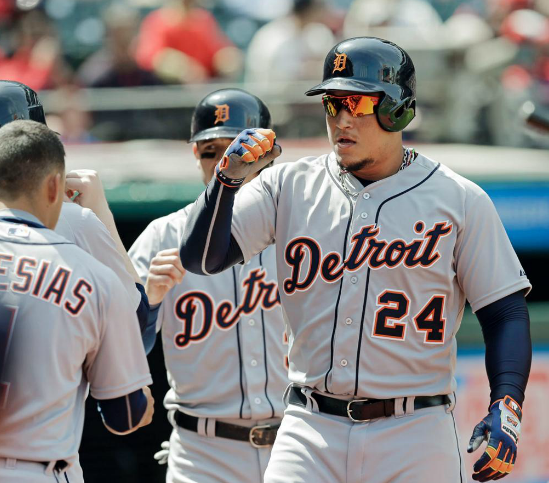 Miguel Cabrera missed the cycle by a triple, reaching base 5 times, homering twice, scoring 3 and driving in 4 as the Tigers out slugged Cleveland, 8-5. Nathan Karns pitched 7 strong innings, allowing just 2 hits and 1 earned run and earned the 8-5 Rays victory in Miami. Andrew McCutchen hit a come from behind 3 run homer to give Pittsburgh the lead in the 6th. He added an RBI single in the 9th and helped top Milwaukee 10-2. Zack Greinke threw 7 shutout innings, letting up just 5 hits and no walks while striking out 7. He won the 7-4 game for the Dodgers in Arizona. They all owned baseball on April 12, 2015. Adam Jones went 2 for 3 with a homer, 2 runs scored and 3 driven in. It wasn’t enough as Baltimore dropped the 10-7 game to Toronto. Cody Asche reached base 4 times, including an RBI single and 2 other hits in Philadelphia’s 4-3 loss to Washington. Posted on April 13, 2015, in 'SullyMetrics' and tagged 1 1/2 2015 WOB Leaders for American League Hitter, 1 1/2 Guys Who Owned Baseball For One Day In 2015 MLB, 2 2015 WOB Leaders for American League Pitcher, adam jones, adam lind, adam wainwright, adrian gonzalez, Andrew McCutchen, avisail garcia, brandon morrow, buster posey, c.j. wilson, Cody Asche, Corey Kluber, david ross, David Wright Guys Who Owned Earned 1/2 A WOB 2015 MLB, edinson volquez, freddie freeman, hanley ramirez, Jacob DeGrom, jake arrieta, james paxton, jason heyward, Jimmy Nelson, jimmy rollins, joe kelly, joey votto, john ryan murphy, johnny cueto, Jose Iglesias, Kevin Kiermaier, kole calhoun, matt harvey, matt kemp, max scherzer, miguel cabrera, Mike Trout, Nathan Karns, nolan arenado, Odrisamer Despaigne, pedro alvarez, scott feldman, scott kazmir, sonny gray, starlin castro, steve pearce, tommy milone, tyson ross, who owned baseball, who owns, xander bogaerts, zack greinke. Bookmark the permalink. 2 Comments.